P. 119: New & returning offerings for 2019 announced! This thread is simple! Rather than having a million little threads about everything that goes on at the Disneyland Paris Resort, including Disneyland Paris and Walt Disney Studios Park, this thread is designed to consolidate it all into one user-friendly thread. Feel free to use it to post updates, trip reports, questions, comments, and of course, general discussion. For pictures and videos of these park as well as past updates, see TPR's Disneyland Paris Park Index Page and TPR's Walt Disney Studios Park Index Page. February 14th, 2005 - Information on Space Mountain Mission 2 rehab - SEE BELOW! January 9th, 2012 - Walt Disney Studios Park to get a major expansion! January 23rd, 2012 - Disney Dreams & Disney Magic on Parade previewed! March 13th, 2012 - 2 new attractions for Walt Disney Studios in 2014! March 13th, 2012 - Captain EO to close on April 1st, 2012? October 17th, 2012 - Video reveals new 'Village Nature' project details! February 28th, 2013 - Ratatouille attraction & Light'Ears announced! June 17th, 2013 - New Disneyland Paris Selected Hotel opening in 2015! September 21st, 2013 - More construction photos of the new Ratatouille ride! February 12th, 2014 - New details released on Ratatouille: The Ride! October 9th, 2018 - New & returning offerings for 2019 announced! Crew members on the maiden flight include Jean Reno, David Copperfield and Gérard Depardieu! Wow, that's one heck of a maiden flight! I wonder who they'll get when Mission 2 opens up April 9th! Last edited by jedimaster1227 on Tue Oct 09, 2018 7:58 am. That is great. I can´t wait to ride SM2. I just stumbled across the following concept art from Toon Studios in a presentation Jay Rasulo gave a week ago in the USA on the Walt Disney Investor Conference. The rather atmospheric drawing is only a snapshot of how this area might look like under ideal conditions, but it shows some neat details. It looks cool and I can't wait to see how it turns out. Last edited by CoasterCrazy on Tue Feb 15, 2005 2:29 pm. ^^ Nice. I mean, anything would be an improvement at that park!!! Wow! That is one awesome trailer! 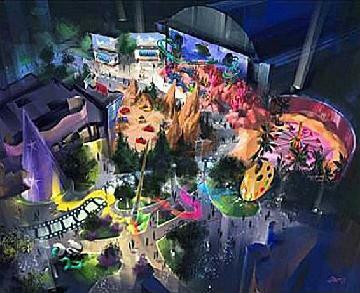 Hopefully, Disneyland can get something nice and exciting like that, even if it's just a random visualization that shows nothing from the actual ride. Gets me exciting just watching it. On the other hand, maybe they'll just use the same trailer and change the words! Date for the (re)openning has change. This is not a joke. Mariage of Prince Charles and ..(I don't now her name) his future wife will be April 9th. Wow! Prince Charles marrying that beast has moved up the date on a coaster opening!